Winter is officially upon us and temperatures are dropping but fear not! There are several ways you can keep the heat from leaving your home! Over the next few pages, take a peek at our list of creative (and resourceful) ways to keep you and your family cozy this winter while keeping heating costs low, so neither your wallet nor your thermostat has to take the hit. Roast those chestnuts over an open fire! 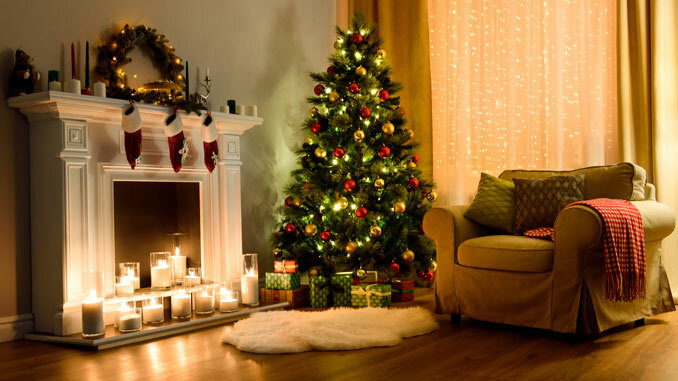 Fireplaces offer romance during the holiday season, creating warmth and improving ambiance in your home. Fireplaces as a focal point are trending right now; step yours up by adding an accent wall, or a mantle to hang those stockings from. If you don’t like the hassle of building a fire, add a gas insert, or fill your fireplace with tall candleholders for a modern look. Don’t have a fireplace in your home? Mobile units are easy to add and often boast chic designs. There’s something special about whipping flames on a chilly December evening, and technology offers many of the same perks of real fires with gas or electric units. When you’re shopping around, test out units to ensure the one you buy gives off enough heat. For another practical way to keep your home warm this winter, you’ll want to make sure to close your damper if you have a traditional fireplace. This keeps the heat from escaping out of your chimney and makes warming your home more cost effective. Stepping onto cold tile isn’t the best way to start a morning. Eliminate chilly toes by replacing floors with a heated system. On a budget? Pick a small area to redo, like the bathroom. Because heated flooring uses radiant heat, it actually works better than most heating systems when it comes to warming your home. Heat typically rises, occupying the space above your head where it isn’t needed. With radiant heat, heat begins at the floor level and slowly rises, occupying the entire room from bottom to top, and keeping you and your home feeling cozy. Warm up other floors with large area rugs. Placing a furry carpet underneath your bed or couch will make those first steps off of the furniture more comfortable. If your home feels chilly in the winter, try adding insulation into the walls. Houses are always insulated, but not always adequately. Take advantage of insulation services offered at companies such as Rod Johnson Air & Solar to give your house some extra padding. Not only will this keep your home toasty in winter, it’ll help keep the heat out in summer, reducing cooling and heating costs year round. An out-of-date furnace doesn’t work optimally. Keep Jack Frost from nipping at your toes by tuning an older unit. “It uses way less gas if it’s adjusted properly,” Rod Johnson, owner of Rod Johnson Air & Solar, explains. In addition to tuning the furnace, it can often help to replace your blower or install a high-efficiency motor. In a worst-case scenario, you’ll have to replace it, but typically these small tweaks can add a few degrees of comfort for the winter months. In San Joaquin County, we’re fortunate enough to be able to enjoy the outdoors all year long, so winter is no reason to hide inside. Make backyard hangouts more comfortable this season by adding heating elements. A quick fix for a chilly patio is a heating lamp reminiscent of the ones found on restaurant patios. If you want to get fancy, add a fire pit or fire table, the latter of which can be picked up at any Home Depot or Lowe’s. Last up, make sure the furniture is ready for winter. We often stack and store patio furniture during the winter months, but cozy pads on those metal chairs and the addition of a few pillows and throws can really warm up an outdoor space in winter. When ducts aren’t properly sealed, heat escapes. This not only cools down your home, but it also makes your heating system work harder, costing you more money every month. Technicians at Rod Johnson Air & Solar can run diagnostic tests on ducts, and if they find any leaks, the crew will seal them up. Warming up a space sometimes has just as much to do with a cozy feel as it does the actual heat. Using warm lighting can instantly transform a room and give it a subtle glow. LED lights and even light bulbs come in many shades, so change out white hues for bulbs labeled “warm glow.” The yellowish tone will feel perfect in dreary winter months. In addition to changing out your existing bulbs, consider adding more lights around the room. This replaces the natural light that goes missing after Daylight Savings forces us to fall back. Corner lights and small table lamps tend to offer a subtler glow than large overhead pieces. Candles can achieve the same effect. Place a few of your favorite scented candles around your home and light them on quiet evenings in.